← Oh how I love BENTO! As I said, I LOVE bento, which means I also love bento boxes! 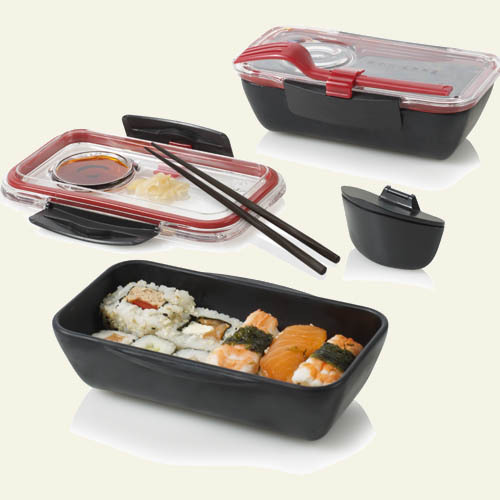 I have a fondness for containers in general, but bento boxes are in a class all their own. I have seen everything from the cartoon-y Hello Kitty bento boxes marketed for very small children (and college girls who want to be adorable), to some very sleek, modern styles marketed for professional businessmen. I had a wonderful friend even send me a couple of bento boxes and accessories right from Singapore – I cannot tell you how freakin’ excited I was to get THAT package in the mail! So in my grand search to find the perfect bento box, I discovered a set from Black + Blum. Researching their other products, they have a style reminiscent of IKEA – clean, simple and functional. Since I am a fan of ReUseIt, a website dedicated to reusable, recycle-able or otherwise environmentally conscious products, I chose to purchase the small and large lunch boxes from them (hint: they do run sales). While waiting for my new bento boxes to arrive, I decided to read reviews about them. I was very glad I did, because there were some complaints. Some people were upset that the clear top of the box got scratched and became opaque, others found that even putting the items on the top rack of a dishwasher caused some warping, and others greatly disliked how the side tabs broke off and rendered the product useless. I’ll admit, I was a little worried. Had I fallen for the pretty packaging and would I be left with a worthless product and less money in my pocket? Then they arrived. For a couple of weeks I just left them on my shelf, admiring the design and cleanliness of them, and afraid to use them for fear of wrecking them. Yeah, I was afraid to use them. I’m a moron like that sometimes. 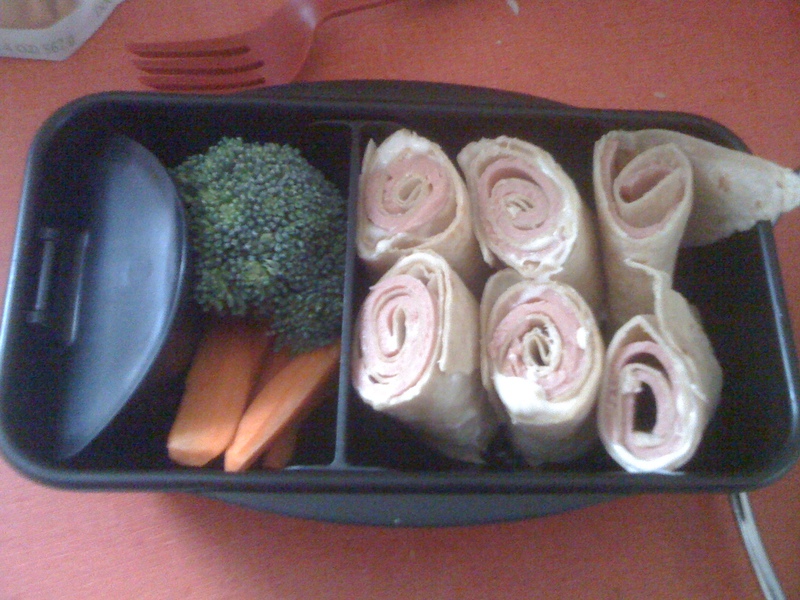 Bologna in a wrap, a few carrot sticks and broccoli, and the little sauce pot had veggie dip. Yeah, it’s wasn’t spectacular by any artistic means, but she LOVED IT. The container made her feel so sophisticated, and for about 2 weeks straight she didn’t use anything else but this container. Each afternoon I made sure to get it back from her, hand-washed it (I have no dishwasher anyway) with the soft side of the sponge, and let it air dry in the dish drain. Easy! There was one time that my daughter neglected to remember where she put it. She swore she had it in her hand when she left school, but it was nowhere to be found. After two days she finally pulled everything out of her backpack and discovered it at the bottom, with one of the side clips popped off. I was devastated! I read reviews where that had happened to other people and it was useless afterward. Except, apparently the company read the same reviews I did and did a little REDESIGN, and I was one of the people with the new design! Once I cleaned all the pieces (I remember the soy sauce… everywhere), it was a simple matter of popping the clip back on. Simple, easy, and no problems. REVIEW SUMMARY: I freakin’ LOVE this bento box! It looks small, but once you pack it with food, it really is just the right amount. I also have the large version (below), but have not used it extensively yet. 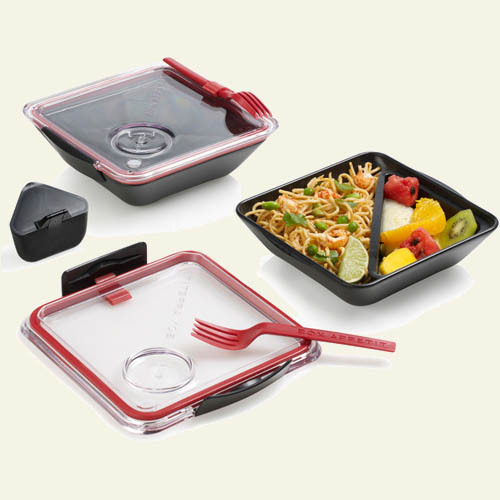 The smaller one is perfect for tightly packed food (noodles, sushi, etc), the larger would work great for lighter, more airy foods like salads so people who are into portion control can put them to the best use. Enjoy! Posted on February 24, 2012, in Bento, Food, Reviews and tagged asian, bento, bento lunch box, black blum, commentary, food, product reviews. Bookmark the permalink. 12 Comments. thank you for the great review of our bento box. We do know that there have been a few problems with some of the lids of our lunchboxes breaking. This was due to a small batch being molded at too high a temperature, which made the material fragile. We have done a few modifications since then to make sure this problem is now solved and we definitely replace any lids for customers whose lids broke (these customers just need to contact us directly). We also thought you might like our lunch-pot, recipe book and new filter water bottle. If these are of interest, please let me know and I can send you some samples. I am really happy to know that problems were addressed by you, and that there is a remedy for the issues. In this day and age when some companies just pump out sub-par products with only profitability in mind, it’s so refreshing to find a company that really cares about the items they produce and the customers who purchase them. I’d be thrilled to check out the products you mentioned, thank you! Have sent a message to your email address, let me know if you have any issues – thank you so much! I’m not a fan of microwave, so I have no interest in plastic even if they claim it is food safe. They stain and overtime becomes ugly. I’m interested with lunch boxes that is made of either ceramic or stainless steel. What is the base container made of? It is a plastic container, not ceramic. I can understand the hesitation, but the weight of a ceramic and glass piece would likely make it a negative for a lot of commuters. Thanks for writing! When we first started to design our lunchbox range, we considered using ceramics for exactly the reasons you mention above. The problem is weight and fragility (for standard economical ceramics available for mass production). We did end up using polypropylene (pp), but unlike most food containers, our pp contains an element of sea shell powder. This gives the pp more of a ceramic feel. It is less waxy and is also available to avoid staining from things like tomato sauce better. It is true that plastic will not age as well as ceramic, but it can be easily recycled and if it does get stained, then it is easy to clean with bicarbonate of soda. Our lunchboxes are also BPA free which is the chemical that you do want to avoid. If you are still not convinced by plastic, then we can tell you that we are currently working on a new lunchbox which does not use plastic. It is aimed more at sandwiches / sushi than salads and should hopefully be available early next year. Hopefully Roguie will also feature it when we launch it.